All our AHA Toners contains: purified rainwater; distillate of witch hazel astringent; seaweed extract [iodine], partly for cell-optimising trace minerals, polysaccharides and sulphonated galactins; comfrey extract, especially for chlorophyll and healthy cell-proliferating allantoin; green tea extracts, partly for anti-inflammatory and anti-oxidant polyphenols, chlorophyll, astringents and organic Germanium; stinging nettle extract, partly for gallic acid, organic silica and astringents; centella extract, partly for chlorophyll and immuno-stimulating and skin-healing accelerative asiaticosides; kombucha (green tea symbiont) extract (selenium), partly for hyaluronic acid and beta-glucan polysaccharides, rare anti-aging bio-actives normally only obtainable from placenta & healing mushrooms (selenium); expressed oil of lemon as natural solvent; vitamin C as cell-protectant, thymol as antiseptic and three genuine alpha-hydroxy fruit acids as astringents, preservatives and more specifically for their collagen, elastin and hyaluronic acid stimulating cytokine reactivation activities. Each toner type has its own unique extras. In addition to the collective ingredients listed above, this product as part formula specifically contains: essential oils of rose geranium, neroli (orange blossom), lavender, rose & German chamomile. The ingredients listed above were scientifically selected following more than a decade of research for specific skin enhancing properties additional to basic nutritive and abovementioned co-constituents and properties, having valuable additional empirical bio-activities far too numerous to mention here. Each of the three toners additionally contains individualised ingredients. These are listed as contents for each AHA Toner entry. The toners form the skin-type specific basis for correct product selection for optimal results, with an appropriate cleanser and moisturiser being chosen to complement and synergise the anti-aging properties of the AHAs. There are no products capable of safely competing with properly formulated genuine alpha hydroxy fruit acids when it comes to delaying and reversing premature visible aging of the human face, neck, arms and hands. 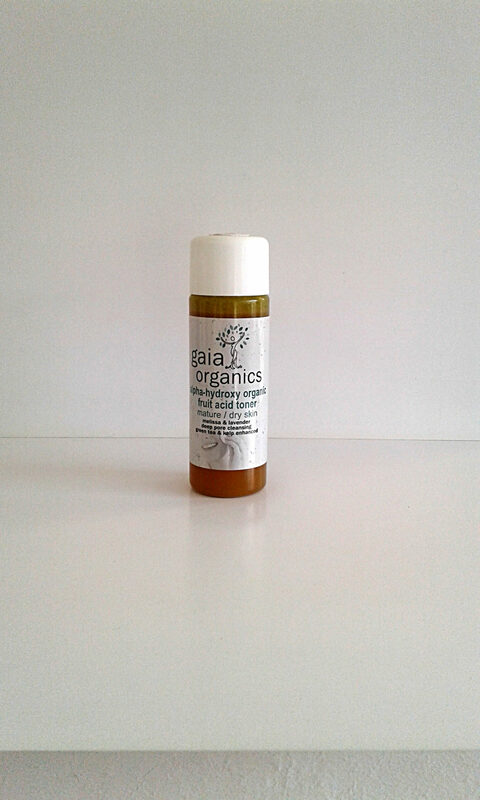 Gaia Organics introduced this natural organic anti-aging technology 16 years ago and even today remains the field leader in this respect. 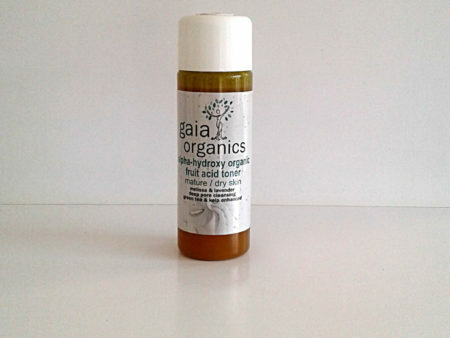 Note: Genuine Fruit Acids cannot thin the skin as reported for other Alpha Hydroxy Acids. Only if spent surface cells are physically exfoliated, can skin become slightly more vulnerable to solar damage. Being fruit-eating animals by design, we are biologically constituted to eat fruit and perspire its acids.